Watering is the most important element of having green grass. There are many factors (climate, soil type, grass type) that determine how long you should water your lawn. The easiest way to figure out how long to water is by watching your grass. If it’s brown or dingy or looks wilted, you need to water more. On the other hand if there is fungus growing on your lawn or all sorts of insects flying around the lawn, you are watering too much. The best time to water your lawn is in the morning before sunrise. Watering in the early morning is important because you will minimize the loss of evaporation to heat. The wind is also calmer in the morning so you won’t lose any water due to drifting, and watering at night keeps the ground wet which can develop into harmful diseases. Sandy soils need way more water than soils containing more clay. Grass in our area needs at least 1” -2” of water per week. Don’t know how much water you are applying? Try the tuna can test. Place a tuna can in the middle of your first sprinkler zone. Water for 15 minutes. Then measure the amount of water in the tuna can. If you times the water amount by how many times you water a week it will give you how much water you are applying. Remember you want at least 1” but more is always better. Do this for each sprinkler zone. Each zone may be different depending on zone size, sprinkler type and sprinkler placement. Also remember by adding or subtracting just a few minutes to the timer will greatly affect the amount of water you are applying. Watering in the Wenatchee Valley can be difficult. There are pockets of sand and rock, but the soil is mostly clay. This makes watering tough too. It is better to water longer once a day or two, but with clay soil you have to water two times a day for shorter periods of time. Once clay is saturated, the water will just pool on top of the grass. If there is moss or mushrooms in your yard, you are watering too much. Fertilizing is one of the most important elements to achieving and keeping a green lawn. One application is good, but four applications is best. 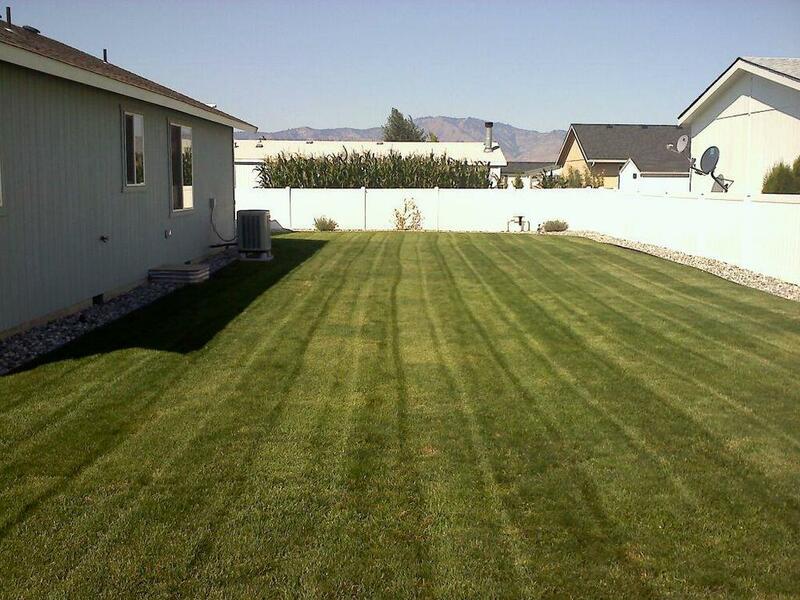 Your grass has different needs at different times of the spring and summer. This is why four applications are best. Apply Fertilizer only on dry grass and in the morning or evening after the sun has gone down. Avoid the hottest part of the day. This can lead to burning your grass. If you don’t want to worry about what fertilizer to use at what time and how much call us today! Also if you hire us you don’t have to worry about those over half full bags. We apply the proper amount. More is not always better. Over applying can lead to run off which can end up in our storm water system and is a waste of money. We have a 5 application program, 4 application program, or single application available. Proper mowing height is another very important factor to having green grass. If you scalp your lawn all the time you are actually hurting it. You are making it susceptible to drought and disease. There is a direct correlation between grass height and root depth. Deeper roots equal healthier lawn. There are two types of grass: Cool Season – Ryegrass, fescue and bluegrass Warm Season – Bermuda, Cetipede and zoysia (our area) I like to mow at 2½ to 3 inches. The grass stays greener and doesn't need as much water and looks way better. Pre Emergent products are used in early spring to control weeds before they germinate. Post Emergent products are used to kill existing weeds. Using the right products at the right time is vital to achieving and keeping green grass. You could be wasting a lot of time and money on the wrong product. To keep the weeds under control, four applications of separate herbicides is best. Most of these can be applied at the same time as fertilizer. So take the guess out of what product to use at what time and give us a call about our packages today.